To those who are new to firearms, I certainly understand that carrying can be a scary prospect, simply because you are placing a potentially lethal object on your body. From what I see in my classes, I know that notion can be quite daunting to someone who, eight hours prior, had never picked up a gun. I had those very feelings when I started. It’s a pretty awesome responsibility once you have made the choice to carry a firearm. You have to adopt a mindset that this is a lifestyle change, which requires a great deal of discipline and practice. It’s a journey for all of us, some need to be eased into it a little more than others, but the end goal for all is safety and consistency. 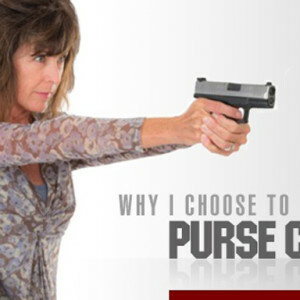 Questions I typically get are “do you carry all day?” or, “what about when you’re at home?” The answer that I give is always, “yes!” My firearm is not a piece of clothing that I only slip on when I’m going out or traveling to the city. That’s where the mindset comes in. You have to get to a point where you don’t feel right unless you have it on you. I have it on me when I’m in my jammies, when I’m cooking, doing chores, running to the store, or whatever. That’s not to say that it should be so comfortable that you’re not aware of it. You should always be conscious of the fact that you have a loaded gun on your person. Of course, you shouldn’t be constantly fixated on it, either. A reliable, safe and non-uncomfortable holster is a must. Did I just use a weird double-negative? Yeah, I did, and for a reason. Carrying a firearm isn’t supposed to be so comfortable that you forget that you have one, but it’s not supposed to be so uncomfortable that you leave the gun in the safe. Hence, the term non-uncomfortable. I also try to be consistent with my actual firearm choice. In other words, I don’t pick out guns for each day of the week, or guns to match my shoes. It’s not a fashion accessory. Instead, I try to stick to one firearm. There are exceptions, of course. I have on occasion switched to a smaller Glock 43 when my clothing choice demands I carry a more sleek gun, but for the most part, it’s the same gun, in the same place…everyday. That doesn’t mean you should be locked to one firearm choice for the rest of eternity. In fact, of late, I have switched my carry choice to a Sig P320, and I haven’t carried anything else since purchasing it. Still uncomfortable with the getting started having a gun on you at all times? No problem. Try this four-step process. Start off carrying with an unloaded firearm with no magazine for about a week. Get yourself used to having it with you, dealing with the everyday tasks like navigating restroom breaks. Find a spot to keep it when you’re in the shower, or where you place it when you’re changing clothes. 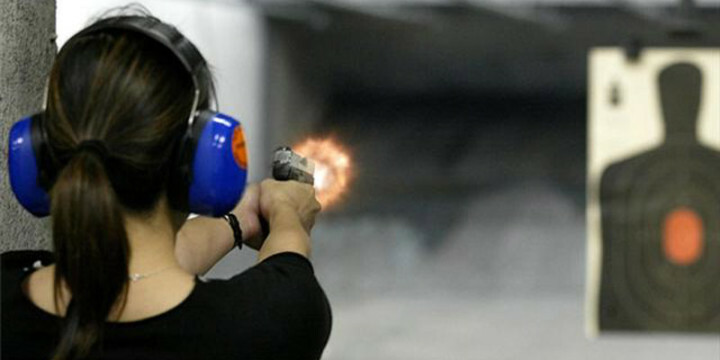 Most importantly, get used to handling it safely, remembering the four rules of gun safety. The next week, carry your firearm with an empty magazine in it. It should be a more comforting feeling by now. Then, carry the firearm with the magazine loaded, but the chamber empty. This you’ll probably want to do for a little while longer while you build your confidence. Your mindset should be that it’s loaded, even if in reality, this process is still a dry-run. 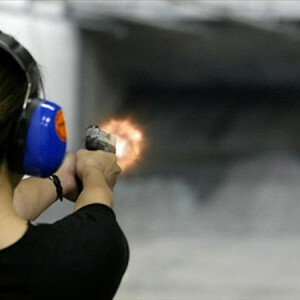 Practice your draw with an unloaded firearm, and I mean A LOT! Once you’ve developed a rhythm, it’s then time to take the leap and carry it loaded, with one in the chamber. 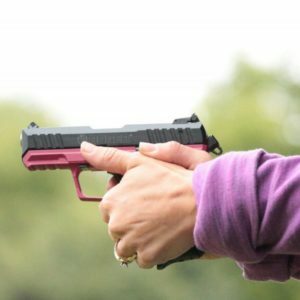 Practicing and creating a consistent daily routine of keeping your gun on you means you won’t leave your loaded gun on the kitchen counter or in an unlocked glove box in the car because you’ve made it a part of you. For some, the journey takes a little longer than for others. That’s ok, because you have leapt over the biggest hurdle, which is making the choice to take responsibility for your own safety. You’ll get there. Kelly is an NRA-certified instructor for Pistol, Personal Protection in the Home and Refuse to be a Victim. She also is also credentialed as a certified pistol instructor through The Well Armed Woman, and owner of ARMED and Feminine, LLC. Visit her YouTube channel by searching ARMED and Feminine.